Months of hard work and planning paid off this past Saturday, March 24 for the line officers of Rowan EMS. 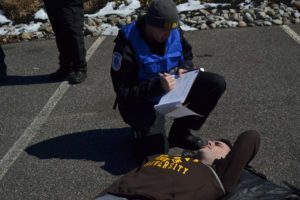 Rowan EMS and TCNJ EMS gathered along with the Rowan Police and Glassboro Fire Department to take part in a Mass Casualty Incident (MCI) training. The past year has gotten a lot of people talking when it comes to gun violence because of the numerous school shootings that have taken place. This training was based on an active shooter situation with students playing injured victims in Linden Hall. The first responders that participated in this drill first sat through Triage and Rescue Taskforce refresher training in order to be prepared for training as well as real-life situations. Early in the morning students gathered at the Hollybush pavilion to receive their mock injury and role in the training. Theatre students used stage makeup to create extremely realistic injuries from gun-shot wounds to concussions and lacerations. They then received a piece of paper with vitals written on it which were given to treatment responders. 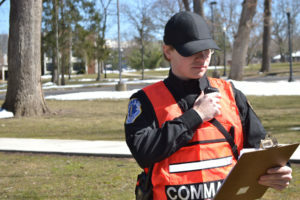 Rowan EMS Captain John Brittin took small groups of students at a time to Linden Hall and place them around the abandoned building for first responders to find. Some were placed in rooms or closets by themselves, others were put at the bottom of stairs or huddled together in a room. 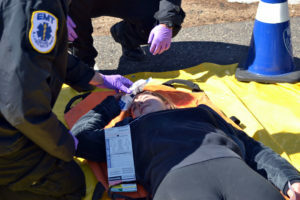 Tina Verchio, a junior biochemistry major and member of Rowan EMS, was given a large bruise on her forehead and was told to hide in a dark closet and stumble out of the building to be found by first responders. “It was a very important drill to conduct,” Verchio said. “Even though it was in a controlled environment, it was still a scary feeling to know that situations like this can not only occur at any given moment but also happen often across the country. However, it makes me feel safer to know that drills such as this one are performed often with local police, fire departments, and EMS because when the ‘real life’ situation happens the personnel have knowledge on how to handle it. Members of the fire department along with EMTs went in shifts to pull out injured students. Rowan EMS Sergeant Jared Sousa was in charge of triage and gave every student a label to decide where they went after exiting the building. EMTs and firefighters waited outside of the building to the extrication teams to bring out patients. Some students were able to walk out with help while others were carried out by responders. After exiting the building students were taken to the treatment area, they were placed on a green, yellow, or red tarp based on their injuries. Patients placed on the green tarp had the least severe injuries, while the red tarp represented the most severe. Rowan EMS Lieutenant Salvatore Toppi and Rowan EMS Sergeant Nick Henderson were in charge of treatment and took down all of the patients’ names and maneuvered them to the appropriate area. 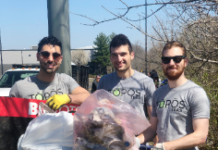 “My teams did their best to stabilize and treat patients while waiting for means to transport them to hospitals for further medical attention,” Toppi said. 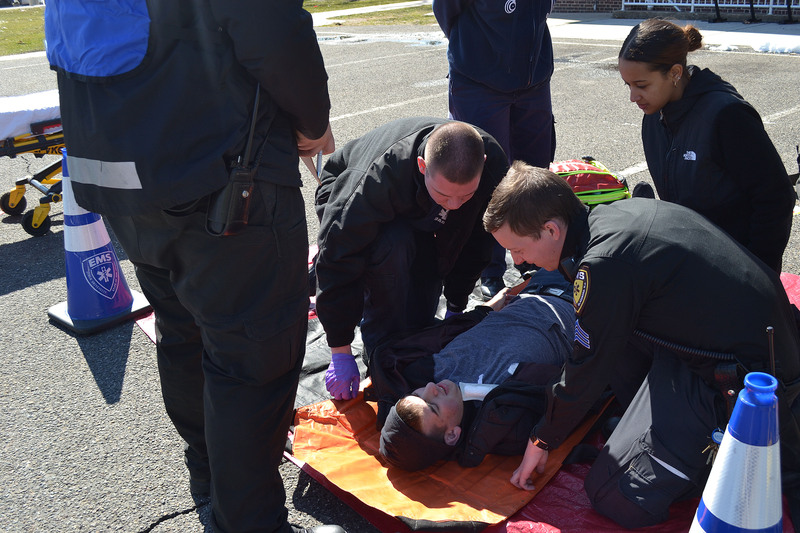 After being treated students were moved to transport where Rowan EMS Lieutenant Allen Kravitz assessed their injuries and decided where they should be transported. “My responsibility was to receive a patient from medical and assign them to a Basic Life Support (BLS) unit for transport to local hospitals. Since this was only a training, no patients were actually taken to the hospital but everything was recorded as if they were. 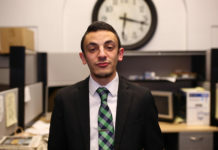 In reality, I would have had to consider many factors like which hospital could handle different types of patients and in which way I wanted to get them there which could have been via BLS transport, helicopter or by school bus for green patients,” Kravitz said. Everyone was rewarded with pizza and drinks after all the hard work they did. There were also speakers who debriefed all the responders and give feedback. “From an overall standpoint, as far as I could see, things went well,” said Vern Howery, chief of Rowan EMS. After he gave his feedback he handed the floor over to Brittin. All of the observers spoke highly of how everyone handled the drill with a few pieces of criticism thrown in. Rowan Police Sergeant Frank Agosta spoke about how the drill allowed everyone to learn about their equipment in a real-life setting and how it made everyone more prepared. 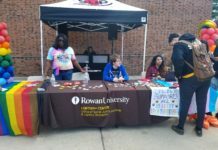 Rowan EMS raised money through RowanGIVES this past fall. The money they raised was used to purchase the materials needed and organized into multiple bags that would be stored on both ambulances and first responder vehicles. Each bag has the materials to treat multiple patients who suffer from a variety of injuries like those seen in mass casualty incidents. Paul Dillard and Eric Dunn from Glassboro Fire Department spoke highly of the drill and how well everyone worked with Sergeant Agosta as well as Patrolman A. Ramos of the Rowan Police Department. All the responders said they felt confident in their skills for responding to real life situations like this one. Rowan EMS hopes to host another training like this one in the near future, incorporating more complex features. Previous articleEditorial: When is a breach of security and privacy too much?